Flicking through a short, enjoyable booklet on the book of Revelation by Jeff “Obadiah” Simmons (and to my charismatic friends, please, it’s “Revelation,” not “Revelations”) today, I was reminded of something that really stood out to me as interesting. Due to its use in Revelation chapter 13, the number 666 has gained the notorious epithet “the number of the Beast.” Conspiracy theorists in the modern age have accused a wide assortment of figures, from Pope John Paul II to Ronald Reagan to Saddam Hussein, of being “the beast,” this nasty figure who appears in Revelation 13 and persecutes followers of Christ. 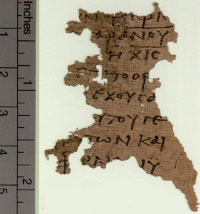 What you might not also be aware of is that some early manuscripts of the book of Revelation – in fact the earliest that we have, such as the fragment found in the Oxyrhynchus Papyri (dated around CE 300) – did not contain the number 666 at all. Instead they contained the number 616. Why? It is very unlikely to have been a simple scribal or copying error. The numbers 666 and 616 don’t look very much alike in Greek, whether written as words or numerals. There’s a consensus among New Testament scholars that the use of two different numbers was intentional. What reason could anyone have had for the change? Consider this: In the first century, both in the Hebrew and Greek speaking world in the Roman empire, it was common practice to, either as a game, a joke, or a literary device, to make use of the numerical value of letters. Consider that in Hebrew, Nero Caesar (the Roman Emperor who persecuted the church in the first century) is Neron Kesar, and that the numerical value of the name based on the value of the Hebrew letters, as would have been well known by John, the author of the book of Revelation, is 666. Now consider the fact that Nero’s title (Nero Caesar) in its Latin pronunciation, when transliterated into Hebrew, has a numerical value of 616. Perhaps the change was intentional, seeing that the Greek form Neron Caesar written in Hebrew characters (nrwn qsr) is equivalent to 666, whereas the Latin form Nero Caesar (nrw qsr) is equivalent to 616. Bruce M. Metzger, A Textual Commentary on the Greek New Testament (London: United Bible Societies, 1971), 752. As the book of Revelation began to be circulated beyond its first, largely Jewish audience (as illustrated in its obviously Jewish style and plethora of Old Testament references) and moved into a more Latin or Greek setting, this numerical device had to be updated so that it might be understood by the new readers. What all of this can be taken to suggest is that the copyists were so sure that the “Beast” was in fact a reference to Nero Caesar, they were quite comfortable simply inserting another number that, like 666, represented Nero’s name. Next Next post: Episode 029: Is Abortion Immoral, and Should it be Illegal? To use a musical analogy, Revelations is the musical equivalent of Frank Zappa meets The Residents. Thomas Jefferson dismissed Revelations as the ravings of a maniac and it’s hard to argue otherwise. 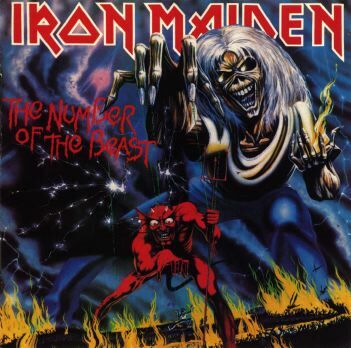 PS: There was a parody band that did a version of Iron Maidens song entitled ‘668 The Neighbour of The Beast’. Paul, it’s easy to think that way about the book of Revelation if one doesn’t know a lot about apocalyptic literature in the first century and how it worked. A modern reader who had never invested the time to study this type of literature, for example, will look at the fantastic creatures, the flaming landscape etc and think “LOL it’s like being on acid!” Someone who has invested the time and energy, on the other hand, will realise the way that such literature was used to make political comment (as political cartoons today, replete with well known images like a kiwi, a kangaroo, a donkey, and elephant etc would). These things would look like something out of Alice in Wonderland to an ignorant outsider. Glenn, I only have one life and with due respect I’m not going to invest any more time ‘investigating’ the weird and wonderful musings of John, than I would do on similar workings of fantasy. I always hated that middle-earth, hobbits crap at school. I was more a Sven Hassel kind-of youth. Never waste my time on fiction & let’s be frank here – The Book of Revelation is mere dated fiction. Sci-fi for desert dwellers, designed to scare the primitive natives into building more churches and to be scared of the all-powerful boogey-man. A Red Dragon with seven heads! Move-over J.R Tolkein & The Brothers Grimm. There are millions that consider L.Ron Hubbard’s ramblings to be gospel, and the fact you & I being ignorant outsiders can’t see his inner workings means we are both unable to translate Hubbards meaning, irrespective of what language we use, right? Hubbard and John have the same level of credibility. Paul, naturally you are not obliged to invest time and effort in ancient apocalyptic literature. I do trust, however, that you will therefore choose not to say that its imagery is crazy. If you admit to not even attempting to see the way such imagery works, this seems only fair. It’s true that I have never studied L Ron Hubbard. For that reason, I am not in a position to say that, had he ever used figurative imagery to make a point, that usage is crazy. This is not much of a concession, as it has nothing to do with whether or not I think his beliefs are correct. You;ve shifted the goalposts by now talking about John’s “credibility” being the issue. My reply concerned, not the truth of John’s message (which I believe and you do not), but whether or not his writing counted as ravings. My request is extremely modest. The alternative, I suppose, is to refrain from objecting when people attack evolution with no knowledge of biology. I’m sure you would never endorse double standards, after all. Matt has a post that runs along the same idea here. Maybe there is some aspect of the prophetic nature or Revelation that I am missing, but something about Nero being the beast doesn’t add up for me when I look at the timing of the beast’s coming. If Nero is the beast, and the beast is an 8th king when we are told specifically that they were only on the 6th king when the book was written, then wouldn’t that mean Revelation would have been written under the reign of Caligula, who only ruled until AD 41. That would make revelation probably the earliest book of the New testament, which I’ve never heard any scholar, Christian or secular, say. Or am I missing something? Hi Joey. Nero isn’t the eighth Beast. He wasn’t the eigth Emperor of Rome – that was Vitellius. The Beast is both an individual and a entity represented by the individual. The beast generically is Rome, the beast specifically is Nero, a representative of Rome. As Kenneth Gentry explains, the seven kings (represented by seven heads) are all referred to with the definite article: “the five fell, the one is, the other not yet come, and whenever he comes a little [while] him it behooves to remain.” (Gentry’s translation). So we’ve got a king/kingdom (that distinction is not always clear) that is “of the seven” specific kings, which once was and now is not. Now notice this: Nero was the fifth emperor of Rome, who committed suicide in AD 68. “Five have come, the one is, the other has not yet come; but when he does come, he must remain for a little while.” Galba and Otho, who immediately followed Nero, reigned for less than a year each. This much alone strongly reinforces the view that the book of Revelation was written toward the end of the 60s, a view held by a decent number of NT scholars. It is widely seen that following the death of Nero (which was the end of Julius Caesar’s line) the imperial dynasty fell into chaos in the civil wars. Imperial Rome (the beast, considered generically) was gone as an organised unit under one emperor. But it was then revived again under Vespasian towards the end of AD 69. The beast who once was, and now is not, is imperial Rome, which temporaily fell into disarray after Nero’s death. This is the period during which these words – by their own claim – were written. Ok. That does make some sense. I was going to bring up the beast’s corporate nature as well (given that you’ve made a big point of it, and I have agreed), which as far as I was concerned could never fit with Rome. I guess it does indeed fit as Gentry put it. I guess that gives me something to consider. Ya know, New Testament prophecy can be a very messy topic. Joey, I think the big key for interpreting the book of Revelation is here: It was written to an initial audience who were expected to understand it. This marks a key difference between Daniel and John’s Revelation. Just a quick confirmation you are a partial preterist, correct Glenn? Or a partial preterist in the sense that there will NOT be a future antichrist, a one world government, a final major war (Armageddon) or even a “rapture” of the church? Pretty much do you believe like many whom I know who are partial preterits the next big event on God’s calendar will be the final resurrection of the dead followed by the final judgment of the resurrected dead? That term has been hijacked by people who reject the orthodox Christian faith with the future return of Christ and the physical resurrection, and they urge people like me to use the term “partial.” But I’m just a preterist. I take that term because I think the events of the so-called “great tribulation” of Matthew 24 actually occurred in the first century. I also think the “beast” was a reference to something in the first century, and I think “Antichrist” was a reference to something that existed in the first century – and now as well, but it’s not one person as some believe. Whether or not there will be a one-world government has nothing to do with the “end times,” but I do think that’s unlikely to happen. What’s on “God’s calendar” now is the continued growth of God’s kingdom until the time when Christ returns and, as you say, the resurrection takes place. Thank you Glenn for the great article. Get Boyd recently gave a sermon series on Revelation (the book), with a view like yours. Some people left the room. The entrenched views of the evangelical pre-trib rapture run deep. So much time is wasted talking about, and speculating on the nature and time of the tribulation to come! It can be frustrating. How many radio programs are dedicated to exactly that? Here in the Minneapolis area I think it’s a religion unto itself. Great blog. Wish I could meet you in Houston.